Two Jumbos travel to the nearby town of Roxbury, Mass. this weekend to compete in the Div. III NCAA Track and Field Indoor Championships. Senior co-captain Kelsey Tierney will be making her first trip to represent Tufts at the NCAA, while junior Rhemi Toth returns for the second consecutive year. With the meet happening so close to home, it is easier for supporters to attend compared to last year, when the meet was held in Ohio. The two athletes are excited for the opportunity to represent Tufts on what feels like home turf. Tierney specializes in long-distance running, while Toth’s focus is mid-distance races. The duo comprise a far smaller squad compared to the six that travelled to Nationals last year. The list of qualifiers was selected on Saturday from the entirety of the Div. III field. Tierney placed third in the 3k with a time of 9:42.49. The time was a PR for her as she was able to shave five seconds off her previous PR of 9:47.49 at the Div. III New England Indoor Championship on Feb. 22–23. Her qualifying time this year was an astounding 53 seconds faster than the 10:24.82 time that she ran in the 3k on Jan. 19, less than two months ago. Meanwhile, in the mile run, Toth placed 14th nationally with a qualifying time of 4:57.39. Toth recorded this time at the Boston University David Hemery Valentine Invitational on Feb. 9. It marked a more than five-second improvement on the 5:02.47 time that she ran on Jan. 26 at the Branwen Smith-King Invitational. Toth attributed her success to hard work in practice. At last year’s NCAA tournament, Toth was one of six Jumbos who contributed to the team’s 11th-place finish. 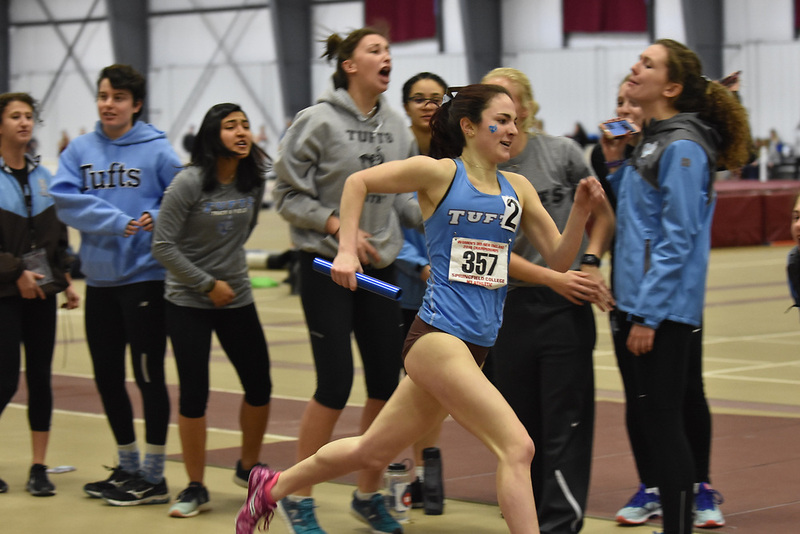 She took part in the distance medley relay in which Tufts placed 10th. Despite fewer Jumbos representing Tufts at the meet, Tierney’s third seed achievement is extremely promising. Last year, long-distance powerhouse Brittany Bowman (LA ‘18) was the seventh seed heading into the 5k race before she eventually took the crown. Tierney only lags behind two other athletes: fellow seniors Emily Forner of Allegheny and Rory Kelly of Middlebury. She is less than 1.29 seconds off the top time — a national championship is well within her grasp. Helen Thomas-McLean contributed reporting to this article. CORRECTION: A previous version of this article mistakenly referred to the Branwen Smith-King Invitational as the Branwen-Smith King Invitational and misidentified senior Rory Kelly of Middlebury as a junior. The article has been updated to reflect these changes. The Daily regrets these errors.